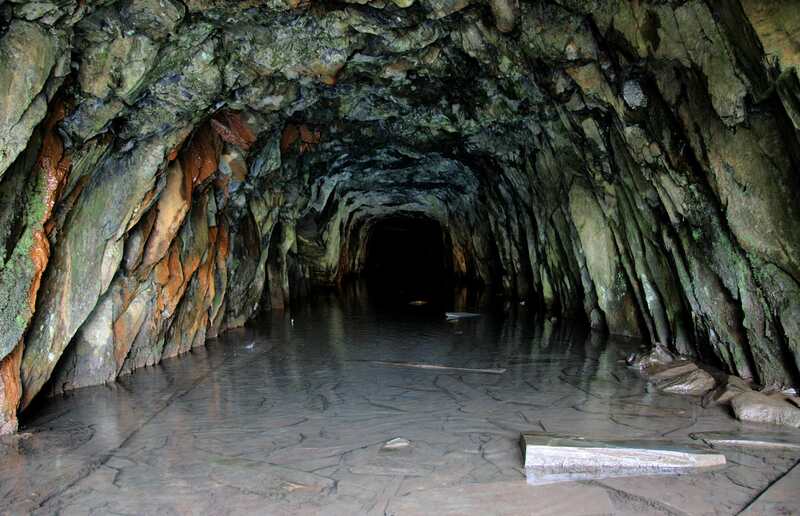 Scattered throughout North Wales, and particularly concentrated in the Ffestiniog area, are a large number of abandoned slate mines and quarries. 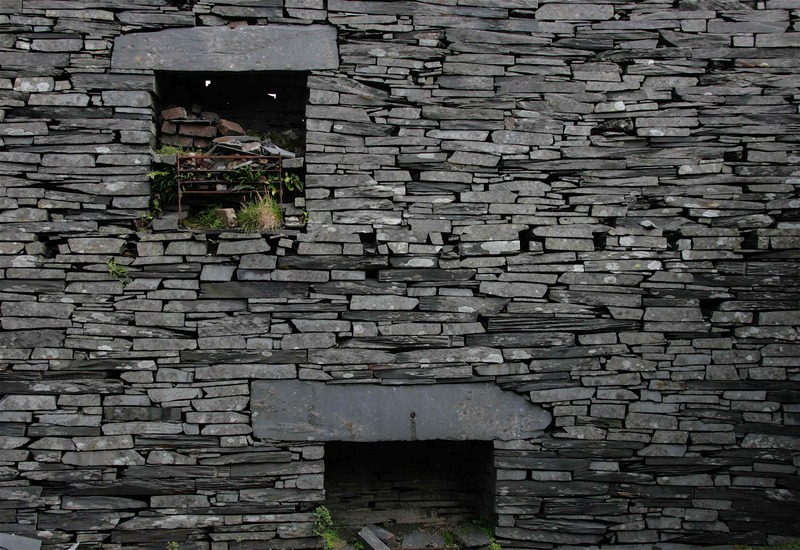 Perhaps the most evocative – and certainly one of the most isolated – is the Rhosydd Slate Quarry. 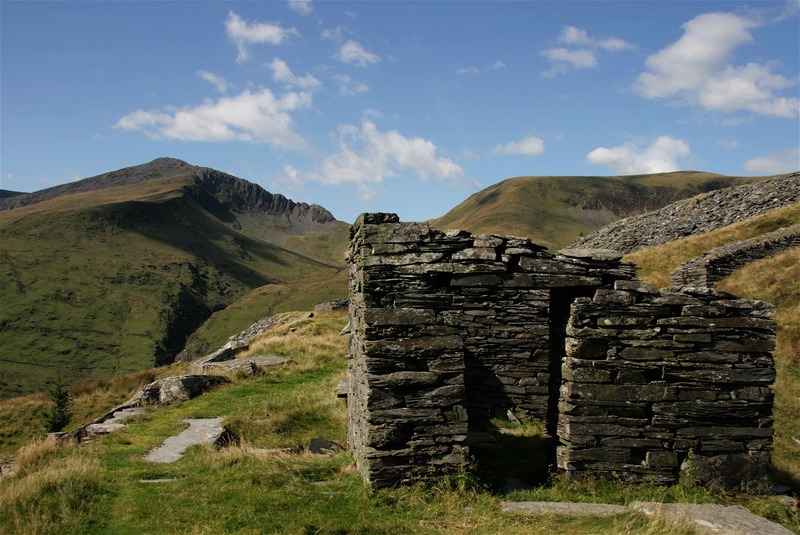 Situated 1500ft above sea level between two mountain valleys, the location of the Quarry is spectacular, facing Cnicht on one side (known as the Welsh Matterhorn) and the bulky Moelwyns on the other. 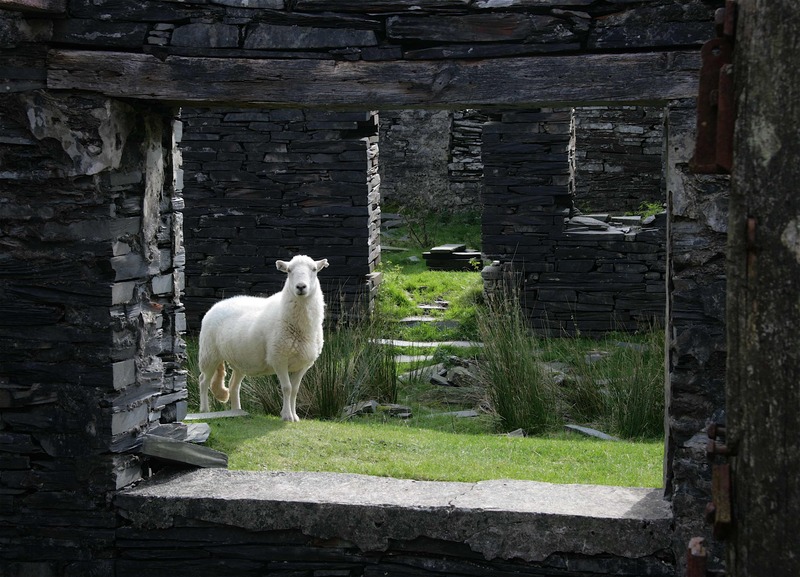 It’s accessible only by a mountain path, being over 2 miles from the nearest road and 4 miles from Croesor, the nearest village, itself remotely situated at the end of a minor road. The remote site of the Rhosydd Quarry adds greatly to its potent sense of mystery. For it’s almost unbelievable to think that for 80 years from 1840, over 200 men were employed by the quarry, many of them living in purpose-built houses in this bleak location – treeless and one of the wettest spots in Wales. The workers’ cottages still stand in splendid but ruined isolation, their house-like quality just remaining in the surviving forms of the windows and chimney (1). 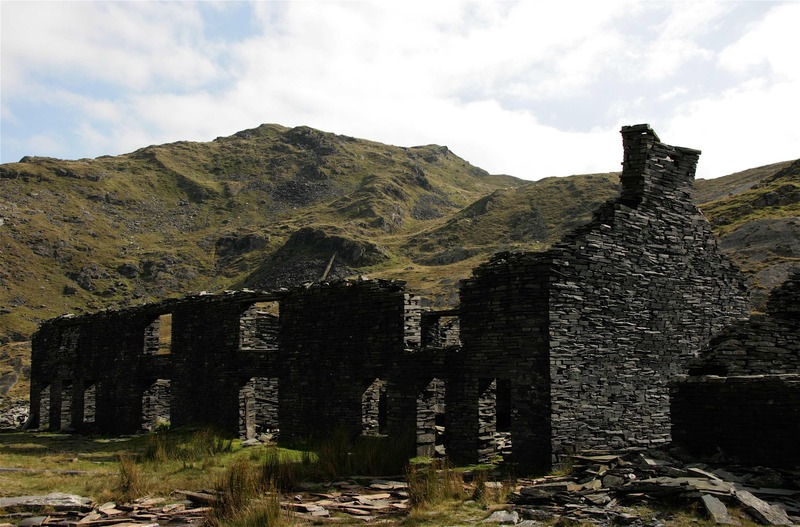 For miles around are scattered enigmatic structures, including bits of rusting machinery and a succession of mills, barracks and adits constructed at different stages of the quarry’s development – testament to the lengths that were gone to to reach the then valuable slate, which lay in beds underneath the mountains. Nearly all of the smaller Welsh slate quarries closed down in the early twentieth century due to falling demand and today only a few working quarries remain around the town of Blaenau Ffestiniog. The buildings of the Rhosydd Quarry express the complete dominance of just one building material: for everything that was built here was built with slate – from the window and fireplace lintels (2 & 3) (sometimes the only surviving bits of entire houses), to fences and walls that enclose and protect the buildings. Close to the houses are entrances to underground tunnels which gave access to the buried slate, hewn by hand and now made strangely beautiful by the return of nature – moss and water bringing colour to the otherwise grey walls of the tunnel (4). In the remains of the quarry buildings, architecture has been eroded into its most elemental forms: walls have bulged outwards, chimneys have collapsed in on themselves, isolated hearths are now surrounding by ruins. If these ruins are bleak and melancholic, they are also beautiful in their geometrical simplicity: in one of the buildings, the one remaining door lintel perfectly frames an enormous almost perfect cone of discarded slate above it (5). The buildings of the Rhosyyd Quarry represent the ruins of an artificial industry naturalised by the passing of time and the brutal forces of nature – ruins that seem to be engaged in a powerful yet mysterious dialogue with their environment. 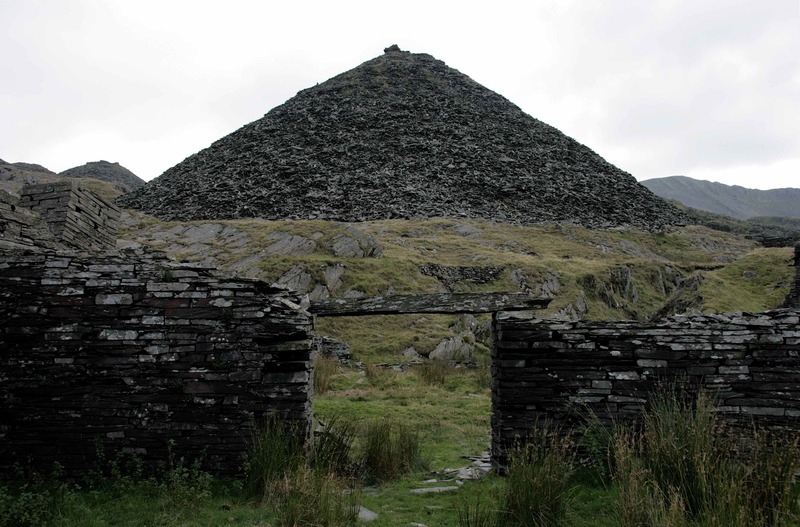 In another remote abandoned slate quarry – the Prince of Wales Quarry – on the flanks of Nantlle mountains, most of the buildings have almost disappeared into the ground. Those that remain seem to testify to their submission to the larger forces that created the landscape from which they arose: the ruined roofline of one decaying building mirroring the form of the serrated mountain ridge behind (6). Nice photographs Paul! visited all the above sites, at one time or another. It’s the only reason now, that I take a flight to the U.K.. “God’s Country” Rob.